It is a pleasure and an honor to be a part of my dear friend Anne's book tour. Anne's Legendary Knits, Vol 1 will take you on a stroll into romance, elegance, and the rich luxuriant textures of the past. The designs were inspired by mythological legends or by folk and fairy tales. Anne has infused her love of historical clothing and ancient symbols into every stitch. Legendary Knits isn't just a beautiful picture book, although the photography is of that quality, it is book of very knitable, wearable, and stylish garments. Another favorite design of mine is the Sleeping Beauty Cowl. The colors Anne uses give the cowl a jewel like quality, as if it were knit with beads, or gemstones. What fun to colorwork pattern would be and the color combinations you could use are endless. This first volume of Legendary Knits has two pair of socks, a cowl, a shawl and a stole, two women's sweaters, and one men's sweater. Both women's sweaters are elegant, romantic, and chic. Six Swan's is one of my favorite patterns in the book (have you noticed a theme? ), as the colorwork design evokes the look of needlework. I have one last favorite to tell you about (although I could go on) and this one is a shawl. I was unfamiliar with the story of Rappaccini until I read about her in the book. Not only does this shawl have a delicate lace pattern, and an elegant border, it sits on the shoulders and stays, which is my new criteria for a shawl. Anne pays attention to detail in her designs, as well as, her pattern writing. Detailed, easy to read charts accompany patterns of colorwork, texture, and lace. The charts for colorwork are in color, which include stitch symbols as needed. I found them easy to see and to understand. Every sweater has a schematic of measurements, which for me, is an important feature. Anne has made sure this book has all the information necessary for a knitter to be successful. The designs in Legendary Knits are available individually on Ravelry or as a complete collection. If you buy the collection you'll not only receive all eight patterns, you will, also, be sent a copy of the book, a beautiful bonus. Anne sent a copy of the book as a gift for one of my readers and, to be in the running, all you need to do is leave a comment. However, I have one requirement. At the age of six I demanded my mother call me Snow White. Did you also have a fantasy name when you were a child? You have until Monday, September 23rd at 5:00pm MDT to leave your comment on this post. Good luck! KALs for the patterns, as well as other designs by Anne, are available in the Wooly Wonka Group on Ravelry. You'll want to keep an eye open for the next two volumes of Legendary Knits, as they are certain to be just as fabulous! You know you've been thinking about gift knitting. You know you have, as Christmas is quickly approaching and now is the perfect time to start. You need a few quick, fun, and creative things to knit. 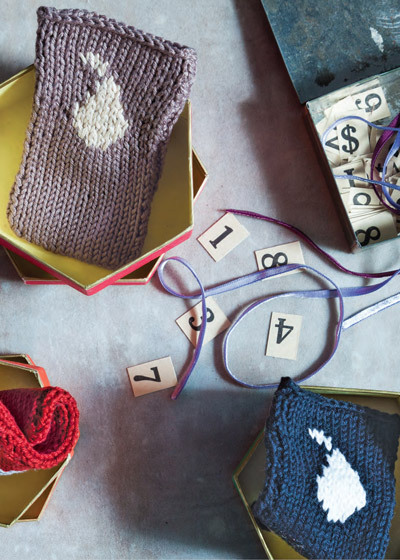 As it just so happens, Jean Moss has a new book full of great ideas for your gift knitting. Last year I interviewed Jean when she published her previous book. She shared insights into her exciting, colorful, and creative knitting style. 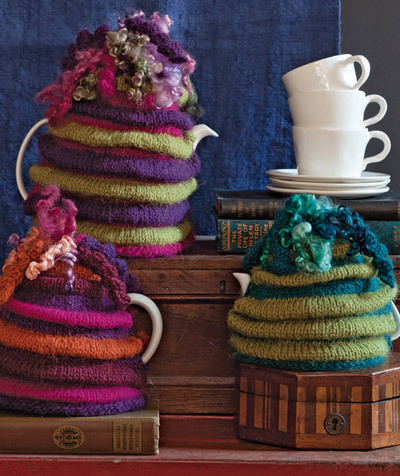 In that vein, the projects in Jean's new book, Great Little Gifts to Knit, are just as colorful and just as fun. The sweetest chapter in Great Little Gifts to Knit is "Baby" and I've fallen head over heels for the bean bags and I can see the chubby tiny fingers of a happy baby grasping one after the other of the bags, as the colors and textures capture her attention. Jean also included separate chapters for "Hers" and "His" gifts. 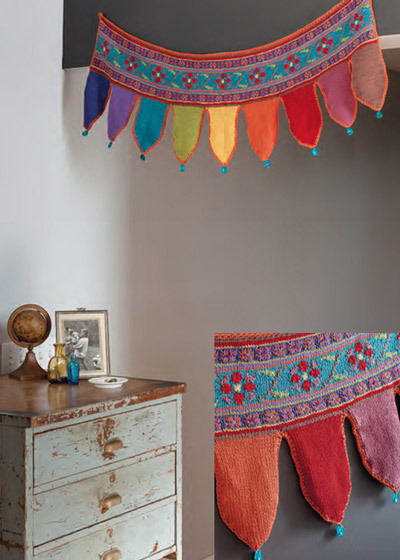 One of the most charming patterns in the book is the Will-o'th Wisp Shawl. It would be a fun wrap to toss over the shoulders whist sipping tea on a cold wintery afternoon. I can think of several color combinations, some contrasting and funky, some soft and elegant, that would make this shawl a delight to knit and wouldnnn't it make a luxurious gift for a dear friend or family member? Not to leave out the men in your life, in the "His" chapter you'll find one of the quickest projects in the book. I got a kick out of the smart phone cover with a pear on the front. My favorite chapter in the book is "Home". I would love to knit every one of the items for myself. The Welcome Toran would be a beautiful greeting on a festive day and the Tea Cozy is so creative and adorable (I really must make one)! But, it's the Checkered Cushions I find speak to me most and I would love to have several color combinations scattered across my couch. Everything you need to know about a project is in the book. How long a project will take, how much yarn, as well as instructions and how to pages. In the back of the book there is a picture index of projects, which I found to be very helpful. Jean did a beautiful job of giving a knitter of any ability the information and techniques needed to make any of the lovely gifts in this book. To win a copy of Jean's Great Little Gifts to Knit leave a comment on this post, by Thursday evening 5:00pm MDT, and tell me if you have started your Christmas knitting! You can buy a copy of your own here. Check out previous posts for the book and continue the fun by reading even more about the book in the next couple of weeks! Enjoy! Tuesday 17 Sept - Zeneedle Margene Smith -ME! Buy your copy of Great Little Gifts at your book seller or at Amazon USA or Amazon UK.